We offer jewelry repair as a service to our customers. What this means is that through us, you will find the best pricing available in town for Jewelry repair. It's our goal to offer your repair needs as a service and at the most affordable pricing. Whatever your needs are, bring your jewelry in and let us evaluate it for repair or adjustments. Many repairs can be done within 24 hours, if needed, for an additional charge. 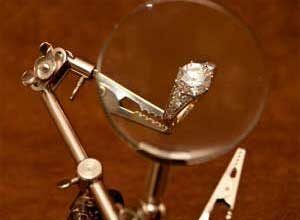 We also offer cleaning, polishing, Rhodium plating, and many other Jewelry Repair type services.